Yet again I have neglected my blog – the culprit a birthday present for a friend and he turned out pretty well. I’m getting the hang of sewing up (although I am going to teach myself how to knit in the round to see if it’s less hassle than all those seams!) and the recipient of the colourful elephant, despite being a very talented crafty person themselves, struggled to spot where all the seams were so they were either being very kind or my mattress stitch is working. 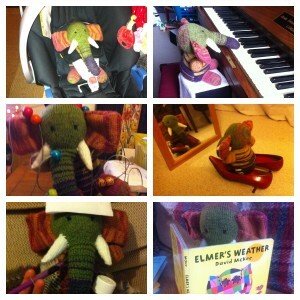 The best thing about this particular elephant is that his adventures have continued ever since he was presented (a week late but it takes time to craft great gifts). So – clearly he’s a bit cheeky as he’s been playing the piano when left alone in the house, trying on his owners shoes and trying to sneak out of the house. He does have his lovely side – entertaining his owners baby, bringing her coffee after a rough night and reading stories. He was a bit poorly but perked up after some calpol and cuddles. It’s been fun receiving the texts showing his latest antics – nothing like giving a gift that is truly appreciated! A bit late this time but month 14 for Eli was a long tiring month for me. Sleep was hard to come by but I still had a lovely sunny boy during the day. So, what is Eli like at 14 months? 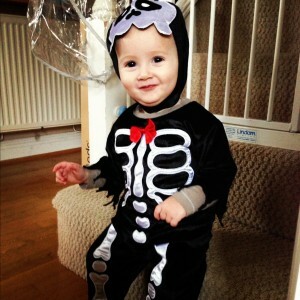 Weight: Not sure, he’ll probably only get weighed again at 15 months. Clothing Size: 9-12 months and 12-18 months, some of the 9-12 trousers are a little short. Teeth: 2 bottom central incisors, 2 top central incisors and 2 top lateral incisors – 6 altogether. Mobility: walking all the time – definitely a toddler. Communication: lots of ‘der’ (there) and his first word for something ‘di-a’ (digger), definitely able to get his point across even if he doesn’t really use many words. Sleep: lots of lost evenings having to go and settle the boy but at least that tooth finally came through. Sleep was horrendous for a bit but does seem to (please!) be a bit better now on the whole. Playing: ring stackers are still a firm favourite as are musical toys that he can dance along to. Eating: happy to try most foods but will spit them out if not liked. He does seem to dislike pasta – not sure that will be sustainable in this house though! Personality: still just a gorgeous, gentle soul – love him! I did make it to the Baby Show in the end and had a great time flitting around buying nappies and other baby bits. 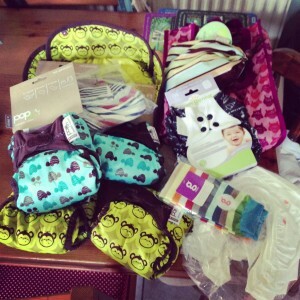 I added 5 more nappies to my Close Parent Pop-In stash, a Bumgenius Freetime nappy (in the gorgeous Albert print) and a new gPant (Gallant). The Close Parent goodie bag (free!) was amazing and I also bought a car seat protector from them in my favourite monkey print. I didn’t buy any Tots Bots in the end, I decided I’ve got enough Easyfits even if the new prints are cute. I think I might have enough nappies now (although I have subsequently bought a new gPant – the gJoy a Christmas print, I am a sucker for Christmas nappies!). To the right is the reason I haven’t been posting much (other than Instagram pictures on my twitter stream) recently. 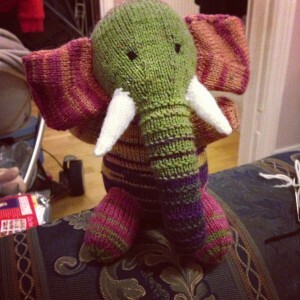 He’s been great fun to knit but has taken up a lot of time. 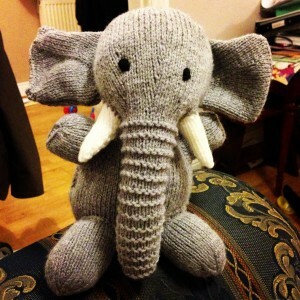 I’m straight on to knitting another one now as a pressie for a friend’s birthday. The colours will be a bit less traditional for hers though. I have a slight preference for variegated (multi-colour) yarn so that’s what I’ll be using, hope she likes it!